Two years after the death of her husband, Heidi is still as lost and heartbroken as the day the tragic accident took him from her. Coaxed by her family, she takes her son, Abbot (a worrier since his father's death) and her niece, Charlotte (a troubled, misunderstood teenager) to a home in Provence that has been in her family for generations. But this is no ordinary home. It is filled with magic! Its very walls were laid through the sheer power of love. Heidi's mother knows this home will heal her...give her what she needs...because it has always done that. Laced with mouthwatering descriptions of food, meals, wine...and scenes in the kitchen and around the table...this is one of my favorite types of books (books with descriptions of lands I want to visit and things I want to see and food I want to taste). "I loved the order of the vineyards. The thick trunk of the vine, the neat rows, the way leaves and fruit were supported by the guidelines. But there was also chaos in those vineyards...The leaves and the gnarled vines and the lurid green grapes grew up wildly from their ordered rows. It was green against dusty rouge, chartreuse against chocolate." 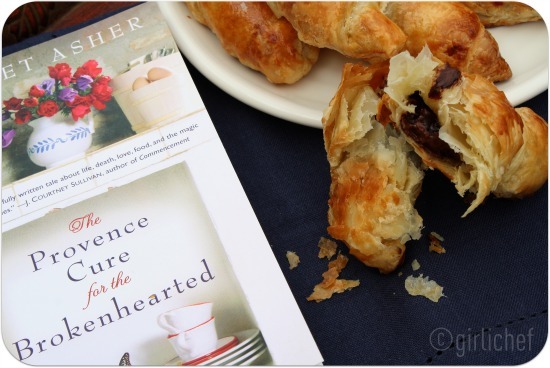 p. 190 A story of love and relationships set amidst food memory and travel. "The very thickness of the vines showed their age, their maturity, their ability to bear fruit that years later would be the wine on a table with a simple meal of pistou and crusty bread." p. 192 It's a story of sharing your heart, even when it's vulnerable. The kitchen is the heart and soul of the home and the people who spend time in it. The sense of calm and unity and grounding become obvious when you just drop your inhibitions and let your senses take over. It's about realizing that there is more than one kind of love. "Véronique then limped into the room, placed the Crock-Pot on the center trivet. When she pulled away the lid, a breath escaped, and the room filled, and my mind emptied. 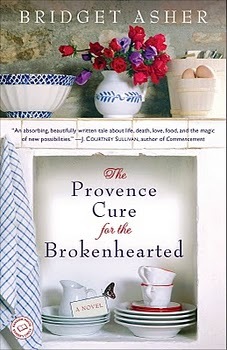 Um, in case I wasn't clear, The Provence Cure for the Brokenhearted by Bridget Asher...I loved it. I received a free copy of this book from the publisher to review. All opinions stated in this post are 100% mine. Update 4/20/11: This giveaway is now closed. A winner has been chosen by random draw (Pierce....congratulations!!!) and contacted via email. Thanks to all who entered. Too bad I am not in States. Can u cast a wider net though. Enjoyed reading your review. Will try and catch hold of the book. Okay, why did I just notice the p.s. part above the comments? I'm laughing so hard! You are so funny. And now I want a croissant. It's breakfast and I want the chicken. And now I am yearning for Provence and it's sun-lit mornings. Lovely, Heather. By the way, your blog entry made me HUNGRY!!!! For some reason, France seems the place to let all your worries go, and just feast on their fine foods! That's where I'd go! This whole post is delicious! I'd love a chance to win the book or a batch of those chocolate filled yummy looking crossants! Believe it or not if I could go anywhere the place I would chose is home - of course minus going to work. That would be heavenly! You sure know how to sell a book. You had me salivating and nostalgic all at the same time. Sold! I totally want to read this book. It sounds wonderful. And, I love those chocolately croissants. New Orleans has been at the top of my list for years. I'd love to go there, but I'd settle for just about anywhere right now. Heck, even Boise Idaho sounds good. LOL! I love to lay by the ocean reading this book with some most needed me time! Wow...this goes on my wish list at Goodreads. 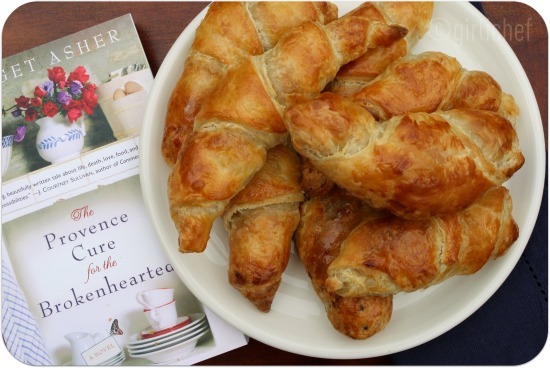 Nice review...love the croissants too. Please, yes, enter me in the contest....my get awya place...would be between Venice Italy or Cahors France. I'd flip a coin! I love reading about all these food novels you've discovered. Please enter me in your contest. :) It's pretty boring, but I go to my room to get away. I'm comforted by my things, my computer, my bed. No major travel required. I just love books about food! To get away I would head to either the Texas gulf coast or the Oregon coast. If it was going abroad and money wasn't a problem then Venice. Love reading the review,this chocolate croissant looks awesome. wonderful review, i'd love to read this book! i'd go back to alaska, but it would have to be summertime! It looks like a really fun book! This is my first trip to your blog. I love your writing, and I love how you wrote about this book! I'll be checking it out soon, and adding your site to the ones I check frequently! You did a beautiful review of this book.I would love to have this book, and would really enjoy the story in addition to trying some wonderful recipes. Thanks for your review. I would LOVE to go to Provence in the summer. Long walks, a good bakery, a bottle of wine and a little fresh fruit would make me a happy girl. I would love to read this book. I've been seeing this book everywhere! It sounds wonderful! Great review! Also, I just read your review of Kitchen Daughter. I just finished that a couple of days ago. It's a sweet read! As for escapes, the reality is that the bathroom is my escape place, but since I don't feel lady-like confessing to that, let me think. To me, a general bookstore or coffee shop in any place would work the magic. I haven't found a place in itself that could do that though. I'd love to enter the giveaway. This may sound too simple, but really to clear my mind, sitting on my back porch, on my white wicker chair, with a kitty cat nearby, helps considerably. I would go somewhere in France where I could eat pastries all day long. Hi Girlichef, I came to look for a delicious pasta and found your nice comment on this book. No, I'm not in the USA, but in Thailand; the place where your mind will clear and where you get some fresh perspective. Of course it's not in the place, but in our head where we will find peace and happiness. When my head clears I will try to write a book about it. Anywhere? Right now I think I'd go to Brazil...I've become enchanted with the cuisine, and I have a yen for tasting the real thing. Mt. Shasta, though, is much closer and while it's not a culinary haven...it's always cleansing and gives me a fresh outlook! And yes...I'd love to win this book! I need to check this book out! I love any book that has food involved- you can see the food on tv, but when someone's describing it in words I can practically smell and taste it...yum.